2. In a small bowl, whisk the egg yolk and one-half teaspoon water together to make an egg wash. Set aside. 3. 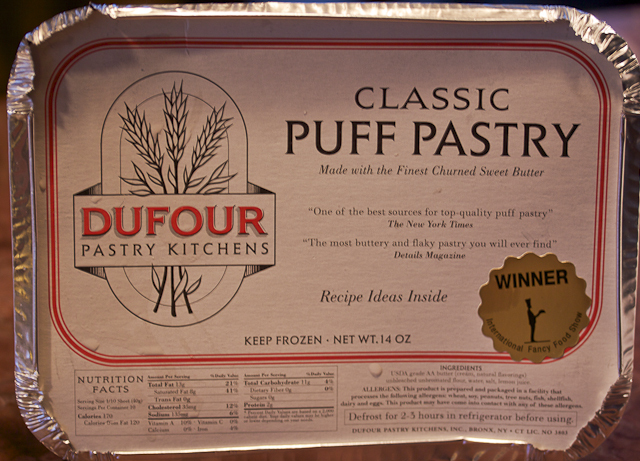 Defrost the puff pastry slightly. 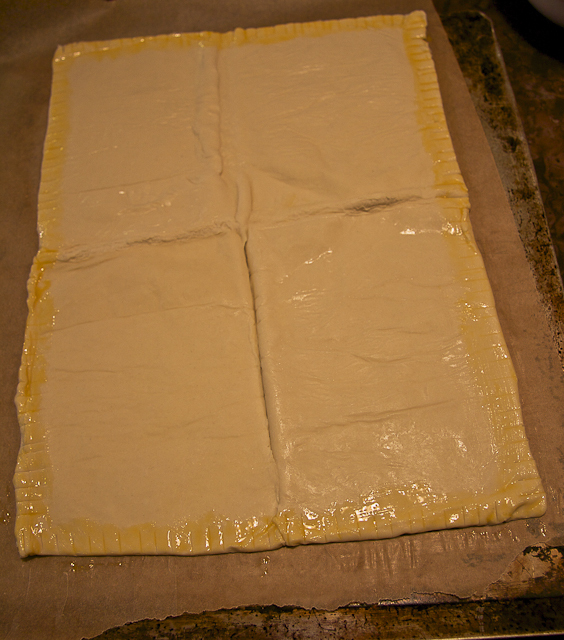 Line a baking sheet with parchment paper and carefully unfold the pastry out on it. Don’t worry if the creases separate a bit, you can push the dough back together gently. With a small knife score a narrow border around the edge of the pastry, about a half-inch wide. Brush the scored edge with the egg wash. Reserve what’s left of the egg wash (you should still have most of it.) Place the pastry back in the freezer and continue with the next steps. 4. Heat a pot of water until boiling, and add the potatoes to it. Cook until just tender but not falling-apart soft, about 20 minutes. NOTE: this timing will depend on the age and size of the potatoes. Remove from the water and let the potatoes cool. Slice the potatoes as thinly as you can into half-moons. 5. Cut the bacon into one-inch by two-inch rectangles, a half-inch thick (if not slab bacon, use whatever thickness you have). 6. Heat a large sauté pan over high heat. Turn the heat down to medium-high, add 1 tablespoon olive oil and heat for a minute. 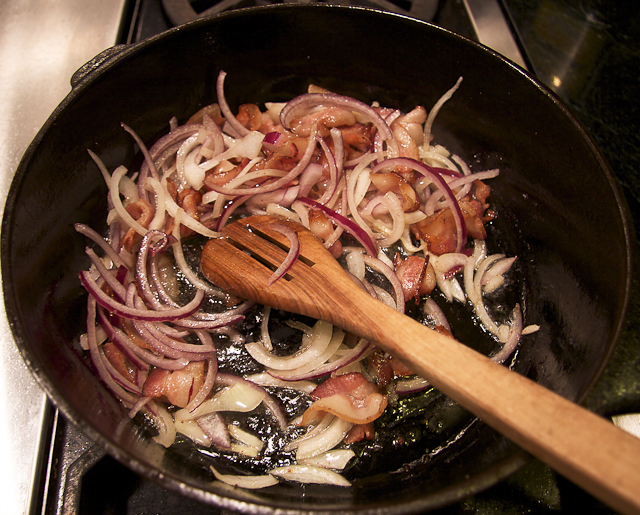 Add the bacon and cook until slightly crisp, about 4-5 minutes. 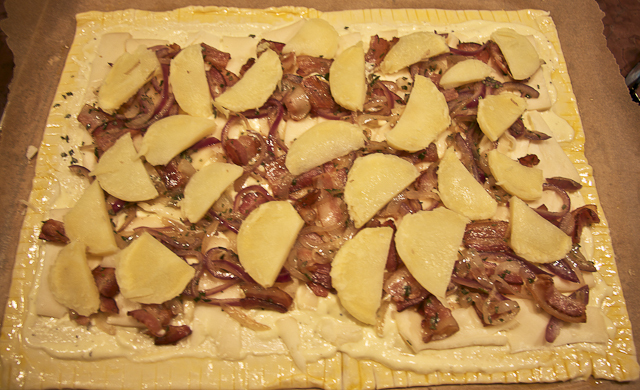 Reduce the heat to low, add the onions, rosemary, lemon slices, and optional lavender. Sauté for five minutes, until the onions are wilting and just becoming translucent. Turn off the heat. 7. Whisk together the ricotta, reserved egg wash, and one tablespoon of olive oil until smooth. Fold in the crème fraîche, a pinch of sea salt and a few grinds of black pepper. 8. Take the pastry out of the freezer. 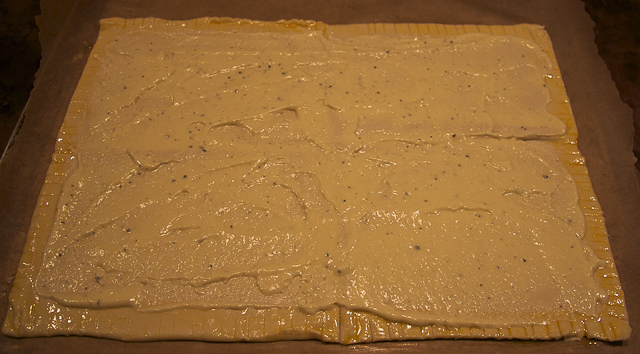 Spread the ricotta mixture evenly over the top, within the egg-wash border. Lay the cheese slices over the ricotta—it’s fine to have spaces between the slices– and then the bacon mixture. Last, arrange the potato slices on top. 9. Bake the tart for 20 minutes on the center rack, rotating the baking sheet after 10 minutes to ensure even browning along the edges. Check after 15 minutes by sliding a metal spatula under the tart and lifting it to see if the bottom is crisping up. 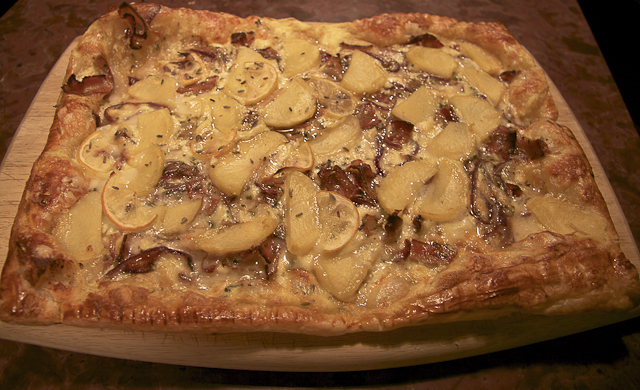 You do not want a soggy, under-baked tart! The cooking process might take as long as 25 minutes, depending on your oven. If the bottom cooks slowly, place it on a lower rack after the initial 20 minutes. Serve right away—it is rich, so cut small slices!